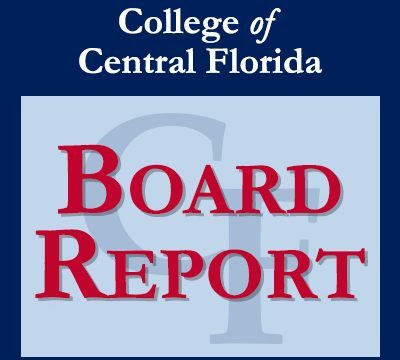 BOARD REPORT FROM THE MARCH 28, 2018, MEETING OF THE CF DISTRICT BOARD OF TRUSTEES The meeting was held at the Ocala Campus in the Founders Hall Board Room. RECOGNITION ■ Randy Ewers was introduced as the newest trustee appointed by the governor for a term beginning March 13, 2018, and ending May 31, 2021. The meeting was held at the Jack Wilkinson Levy Campus. Levy Campus Update Provost Holly McGlashan welcomed District Board of Trustees members, college representatives and guests to the campus, which she said is serving the community well. New science courses have been added, which allow students to complete all prerequisites for nursing at the campus. BOARD REPORT FROM THE JAN. 24, 2018, MEETING OF THE CF DISTRICT BOARD OF TRUSTEES The meeting was held at the Ocala Campus in the Founders Hall Board Room. RECOGNITION ■ President Jim Henningsen introduced Jessica Throckmorton, manager of Governmental Relations. ■ Dr. Jillian Ramsammy, vice president of Institutional Effectiveness and College Relations, introduced Dr.